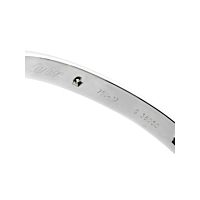 When Cartier set out to make its iconic Love Bangle Bracelets even more gorgeous, they couldn't have done a better job than on this 18k White Gold Size 17 piece! 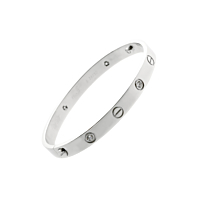 With 6 VS1 Clarity E Color Diamonds (adding up to .60 ct in total) distributed across the exterior of the Bracelet in alternating intervals with the classic Love Collection screws, this piece possess all the design elements that made the original Love Bracelets such a hit - and then takes it to the next level. Simply superb!